As Crio Brü becomes part of morning kitchen routines, it’s inevitable people will experiment in the kitchen with the chocolaty, brewed cacao grounds! The most natural place to start would be brownies and cookies, Crio is great in smoothies too and adds extra nutritional benefits as it is jam packed full of antioxidants and minerals such as magnesium. Once you start to cook with with Crio Brü, you may find you’re drinking Crio Brü for the cooking grounds! Place ½ cup Crio grounds and 2 cups water in a saucepan and heat until it is lightly boiling. Simmer for 10 minutes. Allow it to cool slightly and then strain out the grounds by either running it through a coffee filter or using a French press. Refrigerate and use as needed. Modification: One of our favorite things to do when using this concentrate in sweet recipes is to add two ounces of finely chopped good quality chocolate when simmering the concentrate. Try this with a Hand-Shaken Mocha!!! Add one part Crio Concentrate to one part cold water in a glass full of ice. Add simple syrup and creamer, if desired. Add one part Crio Concentrate and one part whole milk to a glass full of ice. Add a drop of vanilla flavored syrup. If you have a cocktail shaker, shake it and pour into serving glasses. It will have a nice layer of froth just like you would get with a hot latte. Mix equal parts of Crio Concentrate and coconut water then top up with ice - super yummy and so refreshing !! Fill a tall Collins glass with ice. Add a splash of Crio Concentrate. Fill with club soda. Garnish with lemon. Sweeten if desired. Very refreshing! 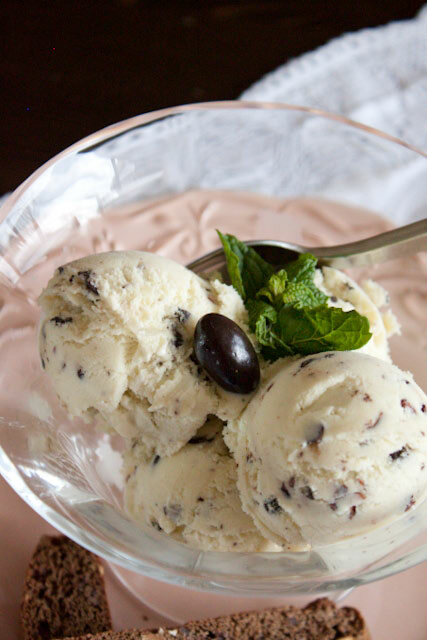 Place a scoop of vanilla ice cream in a dessert bowl and add around 50ml of Crio Concentrate. Top with a little chocolate syrup and a dollop of whipped cream. Garnish with a Crio Bean (or three). Bellissimo! Place 50g into bowl with 800-900g water and cook for 10 min/90°C/speed 2. Whiz for 10 sec/speed 5. Press with coffee plunger or French Press and add sweeteners/creamers to taste as you would with a coffee or tea. In a heavy 2 litre saucepan over medium heat, combine the milk, 1 cup of the cream and the mint leaves. Meanwhile, in a bowl, combine the egg yolks, sugar, salt and the remaining 1⁄2 cup cream and whisk until smooth. Gradually whisk about 1⁄2 cup of the warm milk mixture into the egg mixture until smooth. Pour the egg mixture back into the pan. Cook over medium heat, stirring constantly with a wooden spoon and keeping the custard at a low simmer, until it is thick enough to coat the back of the spoon and leaves a clear trail when a finger is drawn through it, 4 to 6 minutes. Do not allow the custard to boil. Strain through a fine-mesh sieve into a bowl, pressing on the mint with the back of the spoon. Stir in the food colorings. Place the bowl in a larger bowl partially filled with ice water, stirring occasionally until cool. Cover with plastic wrap, pressing it directly on the surface of the custard to prevent a skin from forming. Refrigerate until chilled, at least 3 hours or up to 24 hours. Transfer the custard to an ice cream maker and freeze according to the manufacturer's instructions. When nearly frozen and the consistency of thick whipped cream, add the crio beans while the machine is churning or stop the machine temporarily, add the beans and restart to mix. Transfer the ice cream to a freezer-safe container. Cover and freeze until firm, at least 3 hours or overnight before serving. Heat Cream and Crio Bru grounds in a saucepan over med-high heat. Bring to a simmer then cover with plastic wrap and turn off heat and let steep for 10-15 minutes. Whisk yolks and sugar together until the sugar dissolves and the mixture is pale yellow. After the cream is steeping put back onto heat until steamy around the edges and then slowly whisk the cream into the egg mixture, stir in vanilla, and cinnamon. Pour the custard through a fine mesh sieve into a pitcher. Divide among ramekins. Place ramekins in a deep pan and pour water into the pan to reach up halfway up the sides of the ramekins. Bake at 150°C covered with tin foil or an upside down cookie sheet. Bake until the custards are set but still slightly jiggle when shaken, 35-40 minutes. Take out of the water bath, and let cool for 30 minutes at room temperature. Cover and chill for at least 2 hours. Just before serving sprinkle with granulated sugar, making sure it is even and covers the whole surface. Using a kitchen torch hold the flame close to the surface of the custard until the sugar begins to melt quickly. Move the flame gradually in small circles over the custard, heating the sugar until it is evenly melted and golden brown. Place chocolate in a heatproof bowl. Arrange four 4 ½-inch creme brulee dishes (one-inch deep) on a baking sheet. Freeze. Meanwhile, whisk together yolks, Crio Brü grounds, granulated sugar, and a pinch of salt until sugar has almost dissolved. Bring cream and milk to a boil in a saucepan; gradually whisk about half into yolk mixture. Return mixture to saucepan; whisk. Cook over medium-low heat, stirring, until mixture is thick and reaches 80°C on an instant-read thermometer, about 6 minutes; pour over chocolate, and whisk until chocolate has melted and is smooth. Divide among molds, and freeze until firm but not frozen, 45 to 55 minutes. Sprinkle one tablespoon raw sugar onto each custard; shake off excess. Caramelize tops using a handheld kitchen torch. These cookies look like little snow-covered mountains. They will keep for up to a week stored in an airtight container at room temperature. Roll each ball in confectioners sugar twice to make sure it's thoroughly coated and no dark dough is visible. In a medium bowl, sift together flour, cocoa, Crio Brü, baking powder and salt. With an electric mixer, cream butter and brown sugar until light and fluffy. Beat in egg until well combined; mix in cooled chocolate. With mixer on low, gradually add flour mixture; beat in milk until just combined. Flatten dough into a disk; wrap in plastic. Freeze until firm, about 45 minutes. Preheat oven to 180°C. Line two baking sheets with parchment. Shape dough into one-inch balls. Pour confectioners sugar (about ½ cup) into a medium bowl; working in batches, roll balls in sugar two times, letting them sit in sugar between coatings. Place on prepared baking sheets, two inches apart. Bake until cookies have spread and coating is cracked, 12 to 14 minutes; cookies will still be soft to the touch. Cool cookies on a wire rack. Preheat oven to 180ºC. Whisk to combine flour, vanilla bean paste and salt in a bowl. In a separate bowl beat butter with an electric mixer on medium high speed until fluffy about 3 minutes, scraping down side of bowl as necessary. Gradually add sugar; beat until pale and fluffy, about 2 minutes. Reduce speed to low and add flour mixture all at once just until combined, and add crio bru nibs. Divide dough into 2 disks, press each into a buttered 15 cm springform or cake pan. Using a wooden skewer, pierce dough all over with a fork, Score each into 8 wedges, bake for 15- 20 minutes until pale golden brown. Transfer pans to a wire rack, re-cut shortbread along score, let cool completely. Drizzle melted chocolate over cut shortbread if desired. A recipe perfect for dry winter weather. It's a flavorful, low-fat dessert. Let egg whites stand at room temperature for 15 minutes. Line cookie sheets with parchment paper or silicone baking sheets. In a small bowl mix together the cocoa and sugar and set aside. In a medium mixing bowl combine egg whites, Crio Brü and salt. Beat with a whisk or electric mixer until soft peaks form. When you lift the beater out of the whites the peak will curl. Add the cocoa-sugar mixture a tablespoon at a time. Beat the egg whites until the peaks stand up straight. Gently fold in the cappuccino chips. Using a tablespoon, drop well-rounded spoonful’s of the meringue mixture onto the baking sheets, one inch apart. Bake at 120°C for 30 minutes. Turn off the oven and allow the cookies to dry in the closed oven for 40 minutes to one hour. Remove the cookie sheets from the oven and gently peel the cookies off the cookie sheets and store in air tight containers. Note: Don't plate these cookies too far ahead. Dampness in the air will cause the cookies to become flat and sticky. Preheat oven to 200°C. Combine cocoa powder, Crio Brü and chili powder. Mix well. In large sauté pan over high heat, add one teaspoon oil. When nearly smoking, sear fillets evenly on all sides. Remove fillets from pan to a clean cookie sheet or roasting pan and allow to cool. Once fillets are cool, evenly coat them with Cocoa Rub and put into preheated oven for 10 to 12 minutes for medium rare. Combine first six ingredients in a large zip lock bag. Add steaks and marinate 8 hours, turning occasionally. Heat grill. Remove steaks from marinade and discard marinade. Grill steaks 2 minutes on each side or until desired degree of doneness.